Taxi driver Philip Craig said the situation was "a joke". Up to 600 taxi drivers in Aberdeen could be forced to spend tens of thousands of pounds ensuring wheelchair users can use their cabs. Local authority officers have urged members of the licensing committee to push forward with implementing a controversial policy which would require a 100% wheelchair accessible taxi fleet by June 6 next year. Around half of the mixed taxi fleet in Aberdeen is currently suitable for those in wheelchairs. In a report which will go before councillors on Tuesday, officers argued that the change is necessary to meet the public sector equality duty imposed by legislation. 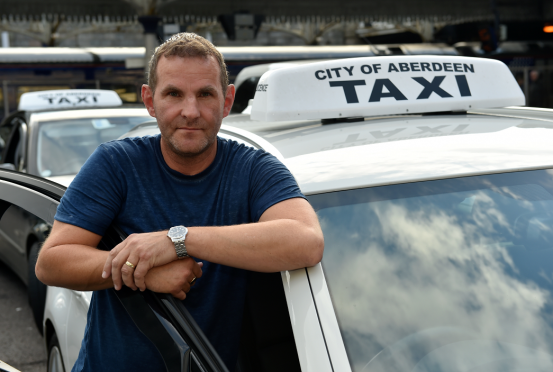 Aberdeen taxi driver Philip Craig said: “I don’t think it’s common sense. We have enough wheelchair accessible vehicles for them here. The licensing committee was previously expected to rubber-stamp the move in June, but councillors instead decided to review the policy, leading many drivers to hope that it would be abandoned. The idea was first agreed in 1994 but with no firm timetable for implementation. A 100% accessible fleet is in place in Edinburgh and Glasgow due to the traditional use of black cabs, but Dundee also operates a mixed fleet. The policy would not affect Aberdeen’s private hire fleet. Unite Union regional organiser Tommy Campbell said: “We think a mixed fleet is the sensible way forward, and we will stand up to put forward that case again next Tuesday. “It’s about what’s right for the public. “More than half of the current fleet of public hire taxis are already accessible – the demand is more than met. One taxi driver queuing on Back Wynd yesterday, who has driven a saloon-style taxi for the past 40 years, said that if the finance committee accepts the recommendations, he would be forced to either retire from the trade or work in private hire. He said: “If I had to change to a wheelchair-accessible car, there would be no way I would be able to afford it. I’m getting closer to retirement age at this point, so I would probably just pack it in. “But that’s just me, it would be a really unfair situation for younger guys who have just started their career. Fellow taxi driver Tom Wilson, secretary of the city’s Wheelchair Action Group, said the policy works successfully in other cities. He said: “We will accept any policy that they put in place provided that it’s fair and non-discriminatory, and the situation right now is discriminatory. “These wheelchair accessible cars that we drive are a lot more expensive than the saloon cars, but we’ve got the same tariff as the saloon drivers – and we don’t get any compensation. “They run 100% wheelchair access in London, Glasgow and Edinburgh, and they run it with no problems whatsoever.